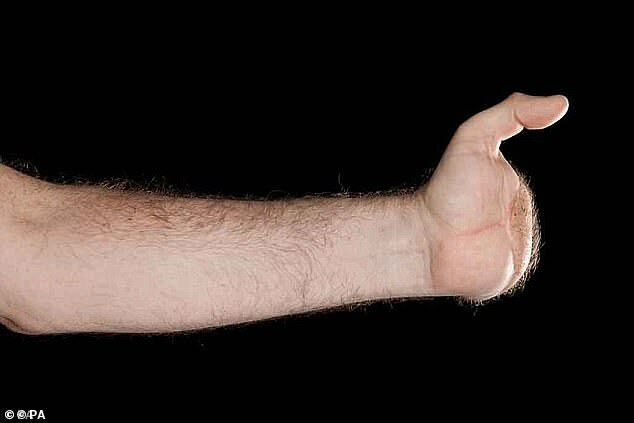 Britain's first double hand transplant patient can now open his own door for the first time in five years. Chris King, 58, lost both his hands - except the thumbs - in an accident involving a metal pressing machine at work in 2013. But following a pioneering operation in July two years ago, he has once again been able to re-use his hands, which come from a donor. Until now, he struggled to open his front door - even though he has penned a thank you note to his surgeon, raised a pint and held his niece's hand. Yet Mr King said he has finally got his 'freedom back' after managing to navigate the key into the lock to open the door for the delivery man. He told The Mirror: 'The reason it's taken so long is the key pushes against my index finger and it was painful. 'But the other day Amazon came with some parcels and I thought "I'm going to give it another go". 'I tried the key and it worked. I screamed, "I've done it. I've done it for the first time." Mr King underwent the procedure to replace both his hands at the UK's specialist centre at Leeds General Infirmary. Recovering after the surgery, he said that he 'couldn't wish for anything better' and described it as being 'better than a lottery win'. In the weeks following the 12-hour procedure, he was able to pour a pint of his favourite Yorkshire ale from a bottle. Nine months on, he revealed he had written a letter to thank his surgeon Professor Simon Kay, who conducted the operation with eight other medics. 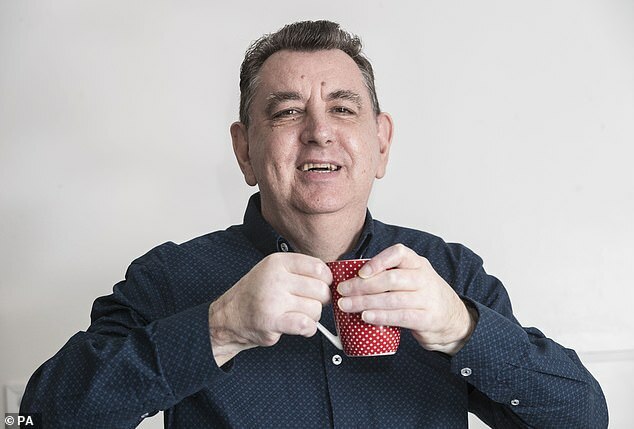 Pub landlord Mark Cahill, from Yorkshire, became the first person in the UK to have a hand transplant in 2012 - performed by the same surgeon as Mr King. 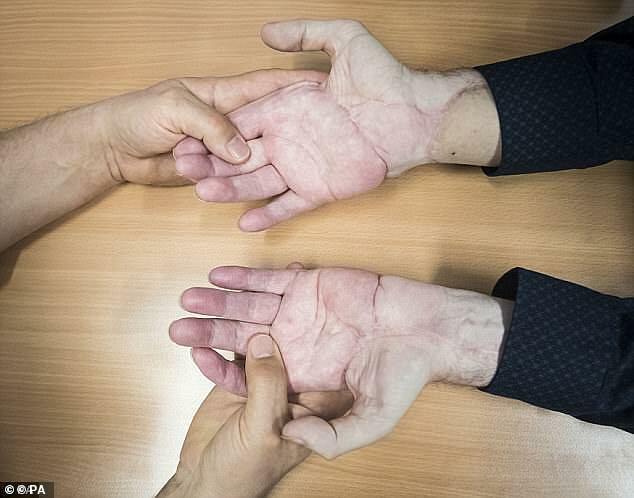 But Mr King, from Rossington, South Yorkshire, whose sister Amanda is now his full-time carer, was the first person to have both hands replaced. Mr King, an avid supporter of the Leeds Rhinos, said he can remember his horror ordeal perfectly but said there was no pain and no trauma. He revealed he was trapped for six minutes at his workplace - Eaton Lighting, in Doncaster, before first-aiders arrived. He was close to death in the ambulance after the terrible incident, but a team of 'unsung heroes' at Sheffield's Northern General Hospital managed to save his life. They also managed to save enough of his lower limbs to enable the later transplant surgery at LGI - which has proved to be a complete success. 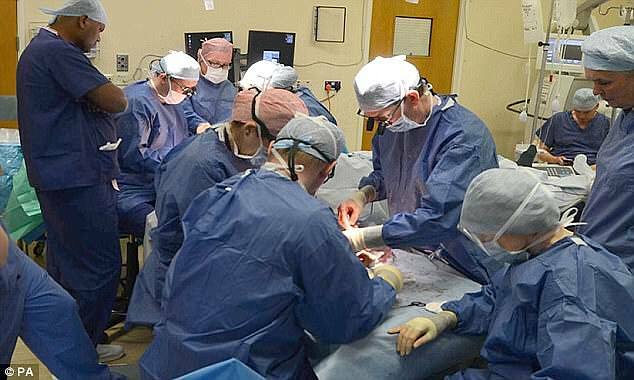 The trust running the hospital was awarded a contract to become the UK's specialist centre for hand transplants by NHS England in 2016. Mr King returned back to work shortly after the surgery to attach the donor hands - and previously said his firm had been 'brilliant'. Last year, Professor Kay, who hopes the procedure will become as routine as a kidney transplant, said he was incredibly pleased with Mr King's progress.